UDM Downloads > SQL Examiner Suite 2008! SQL Examiner Suite 2008 is a quick and easy-to-use software solution that enables you to compare and synchronize both schema and data. It covers all your SQL database comparison and synchronization needs, and fulfills any task on merging databases with just a few clicks. 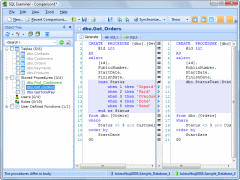 SQL Examiner Suite 2008 is a complete database comparison solution. It includes SQL Examiner 2008 and SQL Data Examiner 2008. In one product, you get two comprehensive tools that complement one another. The suite provides support for all the main innovations of SQL Server 2008, so now you can work with all SQL Server version from 7.0 to 2008, and run cross-version comparison, when one of the compared databases is on SQL Server 2005, for example, and the other is on SQL Server 2005. SQL Examiner Suite 2008 supports Oracle and MS Access as well, and allows cross-platform data comparison. It is also able to use different comparison sources, and runs equally well on a backup copy, a detached database or database snapshots. With the suite, you can compare all data objects, including tables, views and SQL queries. The list of the schema objects it compares includes tables, stored procedures, views, user-defined functions, XML schema collections, CLR objects, database triggers, etc. Due to its flexibility you can be as involved in the comparison process as you want. You can choose step-by-step or automatic synchronization, so the built-in Command Line Comparison and Synchronization Tool allows you to automatically perform any actions available in the GUI. But even if you choose the automatic one-click synchronization, you can undo it any moment to adjust the settings. SQL Examiner Suite 2008 is a solution that enhances the profitability of your business. Now you can forget about routine manual work and focus on design and development, as the suite will handle all the tedious manual work itself.